External Building Contrators was after a full service for their website with products ranging from Web Design and Development, SEO to Email Marketing. External Building Contractors was after full service offering which included Web Design and Development, SEO and Email Marketing. The requirement was to have a successful presence over their competitors online and have an excellent collection of projects to show potential clients. There was also the requirement to have the ability to send out marketing emails to potential clients to attract new sales. Our approach was to create a impressive website that will make it easy for potential clients to view their projects and get the information they need. We also focused heavily on creating a strong presence online through SEO and PPC campaigns. The additional requirement was to offer the ability through our Email Marketing services to send out very brand specific and sales heavy marketing emails to generate new clients. 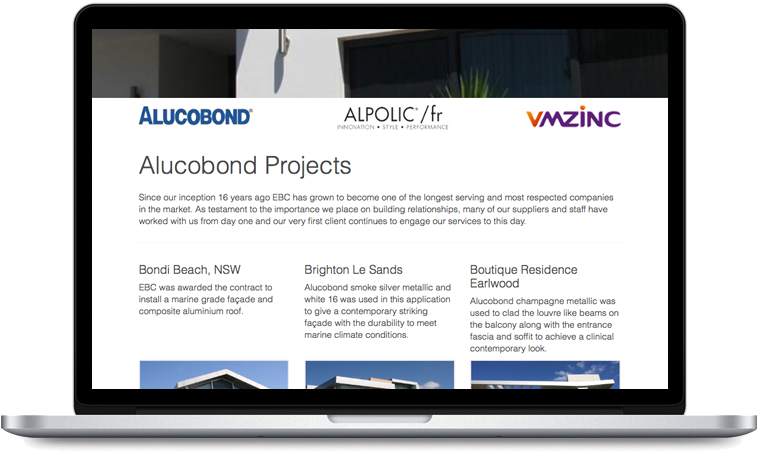 We launched the External Building Contractors website which achieved great results including being one of the top companies in this industry to be displayed in the top positions on Google and other search engines.